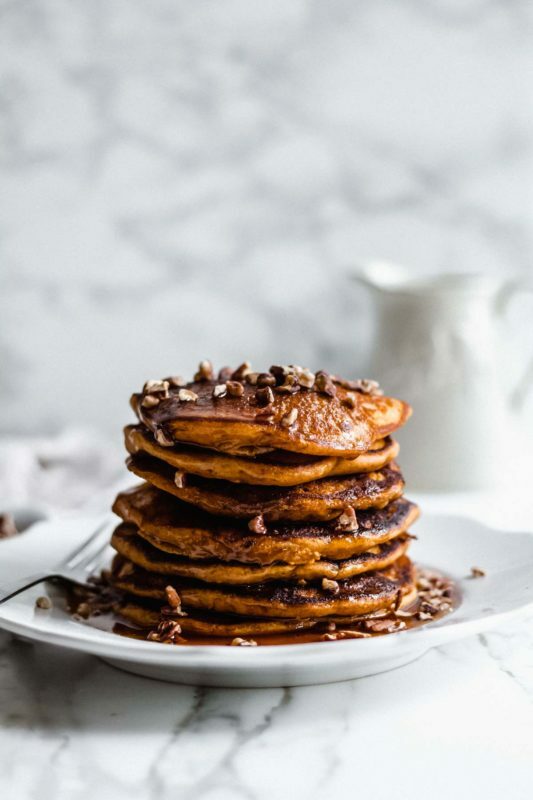 These pumpkin pancakes are fluffy, perfectly spiced, and a great accompaniment to fall and winter mornings. I know it’s a little late to be sharing another pumpkin recipe, but based on a very scientific poll I took on Instagram the other day, I think most people are ok with it. Squash is still in season, after all. The reason this recipe is so belated is purely due to the amount of time I spent testing and perfecting it. I will come right out and tell you that it took me three full batches of pancakes, with varying levels of pumpkin and spice, to get this one right. 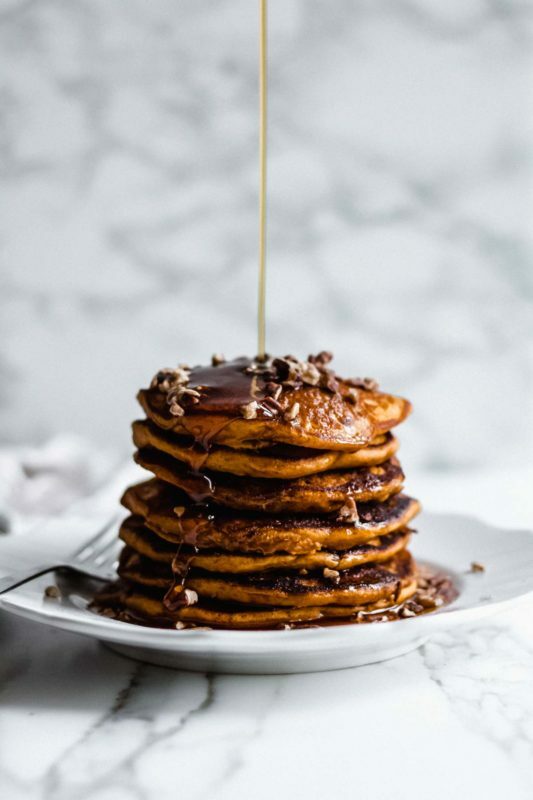 We were practically swimming in pumpkin pancakes, I made so many. Not that that’s a particularly bad problem to have. This recipe has a history, though, and I needed to get it exactly right in order to pay the proper tribute. My grandma would not be happy with me otherwise. 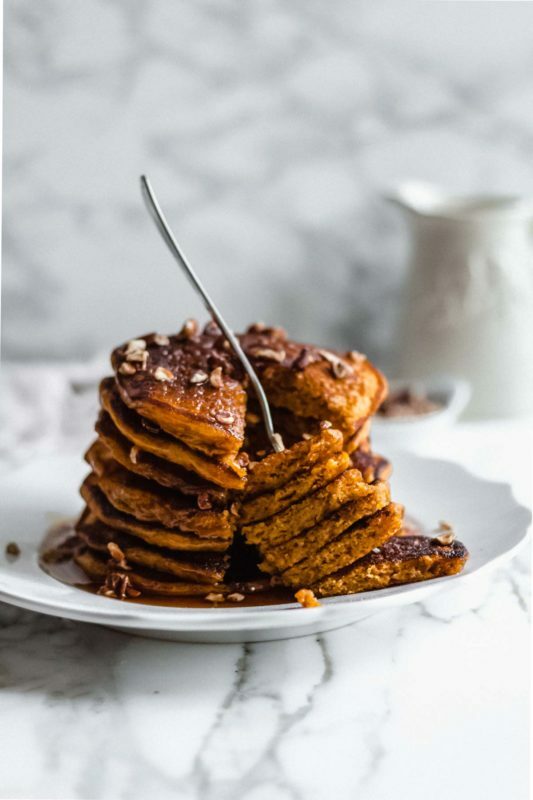 Here’s the story: my grandma created the original version of these pumpkin pancakes pretty much on the fly (as she did most things). My mom informs me that Grandma based it on the basic pancake recipe found in Betty Crocker’s 1969 cookbook — a cookbook which, by the way, is now in my possession — and she was kind enough to give my mom some approximate measurements, which Mom then passed on to me in a family cookbook created for our wedding. 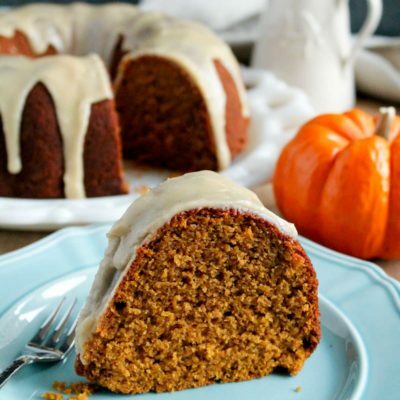 The recipe has a very distinctive ingredient that makes it unique: pumpkin pie mix. Not plain pumpkin purée. No, she used the canned pumpkin pie mix that already has all the sugar and spices added in; the kind where all you do is add eggs and bake into a pie. The one basically no one buys anymore. The benefit of using the pie mix was that it already had the perfect pumpkin spice ratio, and I’m sure that’s why Grandma did it that way. 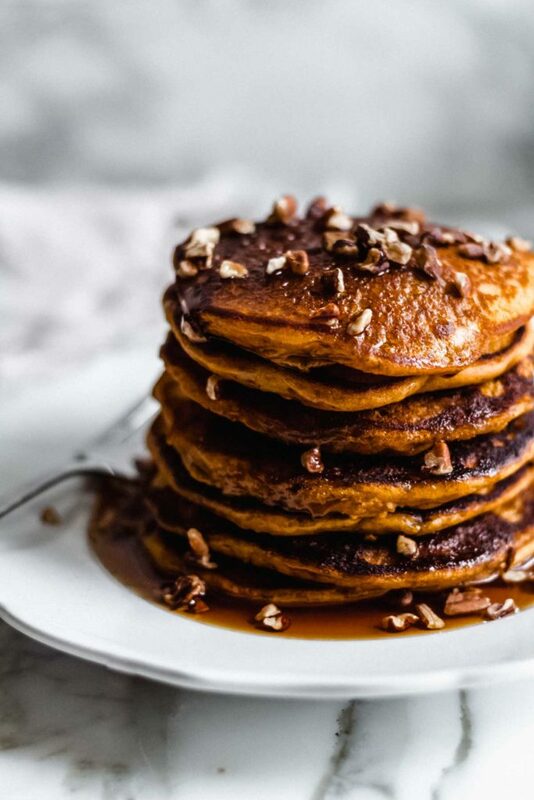 I grew up eating these pumpkin pancakes every fall and I loved them. They have a particular taste and texture from the pie mix that always reminds me of childhood. I knew, however, that I had to do some updating if I wanted to share the recipe here. I wanted to replicate the flavor the pie mix imparted, but control the sugar level by using plain pumpkin purée and my own blend of spices. I also wanted to improve the texture – they had always come out a little too wet. Batch #1: first I made a batch of the original recipe for comparison (and my mom managed to find a can of the pie mix for this specific purpose). I needed to have a baseline. They came out gooey and tasty, as they always did. Batch #2: Grandma’s measurements were imprecise, but she basically called for half of a 28-oz can of the pie mix, which I figured equated to a 15-oz can of pumpkin purée, so I started with that for batch two. I added some sugar and guessed at spices: cinnamon, ginger, nutmeg, cloves. I gave it a whirl. Batch two came out ok, but the texture was altered by using purée instead of the mix, and not in a good way. They were gummy, way too wet, and the spices weren’t correct. They also seemed to burn very quickly on the griddle (by the way, I highly recommend buying a double burner griddle pan if you make pancakes semi-regularly – it makes the process much faster). They needed better texture and flavor. Batch #3: the winner! 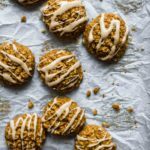 In this batch, I knew I needed to adjust the sugar and spice levels for flavor, and decrease the amount of pumpkin and add healthy fat to improve the texture. 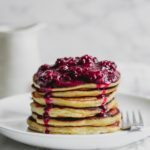 Pancakes actually need some fat in the batter to achieve that fluffy texture we all love. 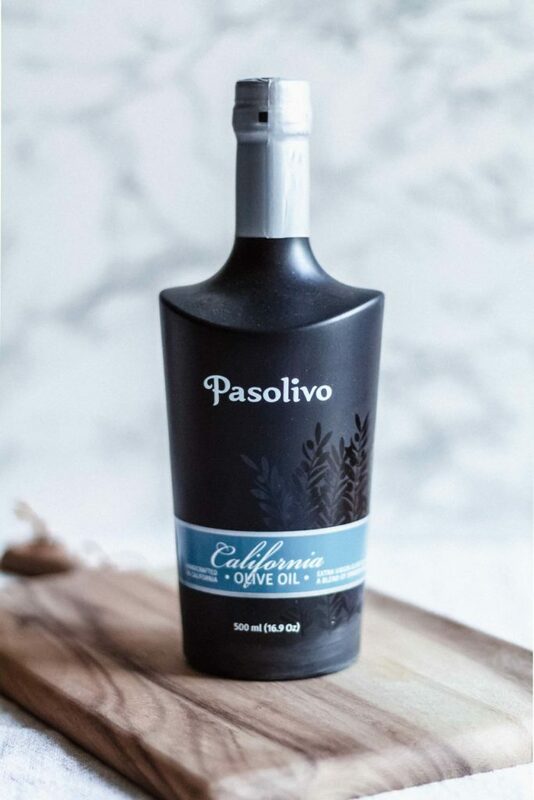 I decided to use Pasolivo’s olive oil, which they sent me to try. I thought the mild flavor of the oil would pair well with the pumpkin. I’ll cut to the chase: I was right. 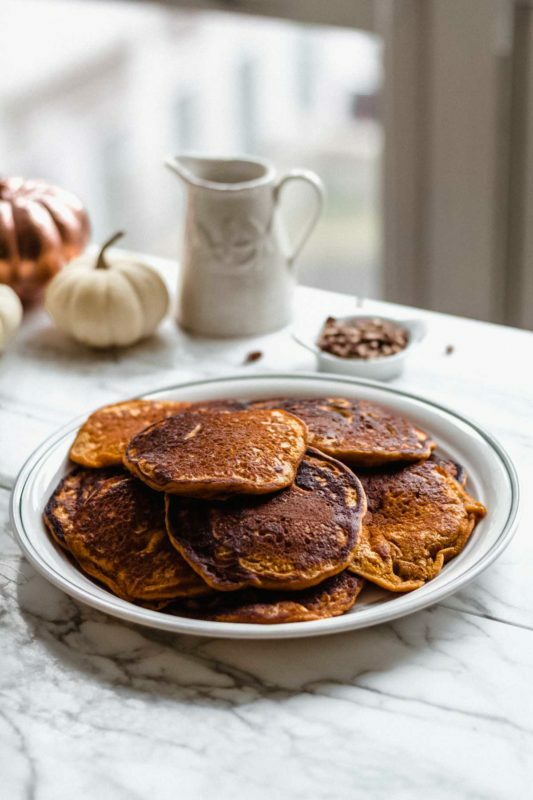 Finally, the pumpkin pancakes I’d been imagining: light and fluffy, yet deeply spiced and pumpkin-y and reminiscent of chilly mornings and falling leaves. The texture was spot on, the flavor exactly how I wanted it. We had an official taste test with my parents of all three batches side by side, and they agreed (my mom a little begrudgingly): Batch #3 was the winner. 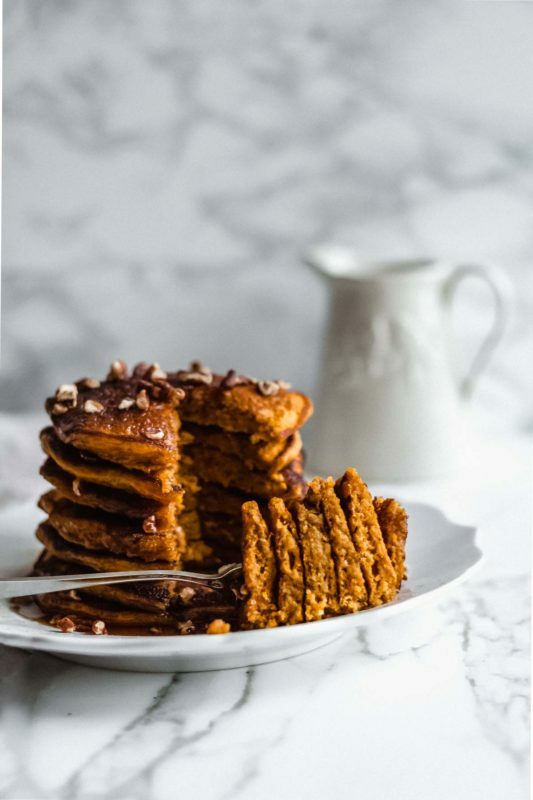 I think my dad said something akin to “these are the best pumpkin pancakes I’ve ever had.” I’ll take that review any day! I hope you make these pancakes soon, whether it’s fall or not. My Grandma would be proud! In a large bowl, whisk together flour, baking powder, salt, and spices; set aside. In a medium bowl, whisk together milk, pumpkin purée, egg, olive oil, and sugar until fully combined. Pour the wet ingredients into the dry and stir together until a batter is formed. Try not to over mix – stir just until combined. Heat a griddle pan or a frying pan over medium heat. Grease the pan with butter, then drop batter by 1/4 cup measure per pancake. Spread the batter out a little with the back of the measuring cup. Cook 3-4 minutes on the first side, then flip and cook 2 more minutes or until golden. Remove to a large plate. Repeat with the rest of the batter until no batter remains. 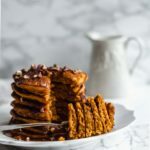 Serve with maple syrup and pecans! Leftover pancakes can be stored in the refrigerator for a few days, or freezer for longer storage. My personal preference is to wrap individual portions, i.e. 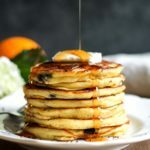 2-3 pancakes, in plastic wrap, then store them in the freezer in a freezer storage bag and reheat in the microwave on busy mornings when you want a special breakfast. Thank you to Pasolivo for sending me the olive oil I used in this recipe. All opinions are my own! Like this recipe? Please leave a comment or tag me on Instagram @katiebirdbakes, and sign up for my email list to receive my recipes straight to your inbox every time I post!